Labeled workspaces help improve the experience of “Finding & Reminding,” in multiple parts of GNOME Shell, as I mentioned in my earlier post. 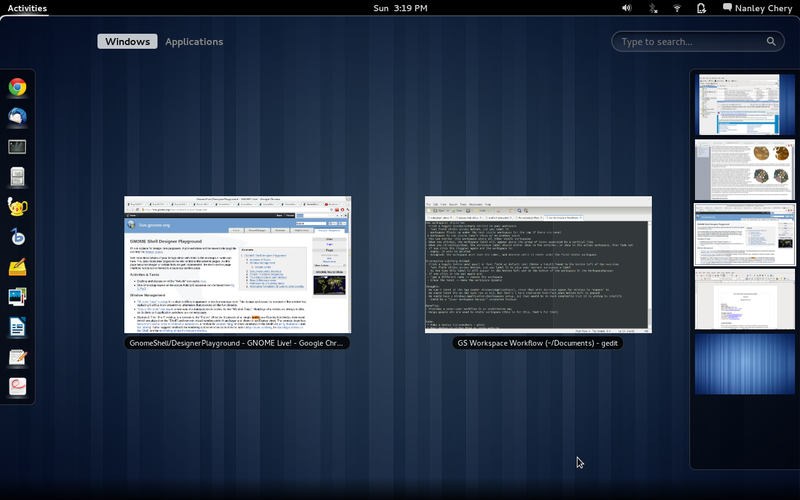 Let’s take a look at two parts of GNOME Shell that could be improved with this concept. When switching workspaces via the keyboard, the user is faced with the task of finding what activity is on each workspace, before they reach their target destination. An improvement to this situation will not decrease the amount of workspace traversals the user must make, but it will get rid of the time the user spends examining each workspace traversed, behind the dialog. With the configuration on the right, the user simply sees their target label and moves until they reach it. No need to examine each workspace in between each move. 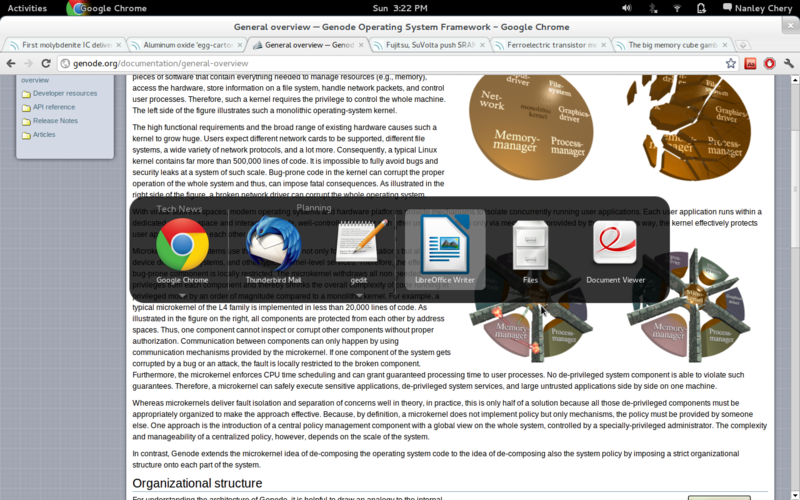 The current alt+tab dialog’s organization with respect to workspaces is simple once you grasp it. It puts your current apps on the left of a line, and all other apps on other workspaces on the right side. If there are apps w/ instances across different workspaces, this line-based separation is found under a nested list. This application-centric view effective as it is now, but I believe that the use of labeling, like in the figure on the right, would make it easier to find “which” instance of a certain app a user wants. Due to the nature of workspaces being activity-focused, I believe it would be a great improvement to include labels while switching among them via keyboard. 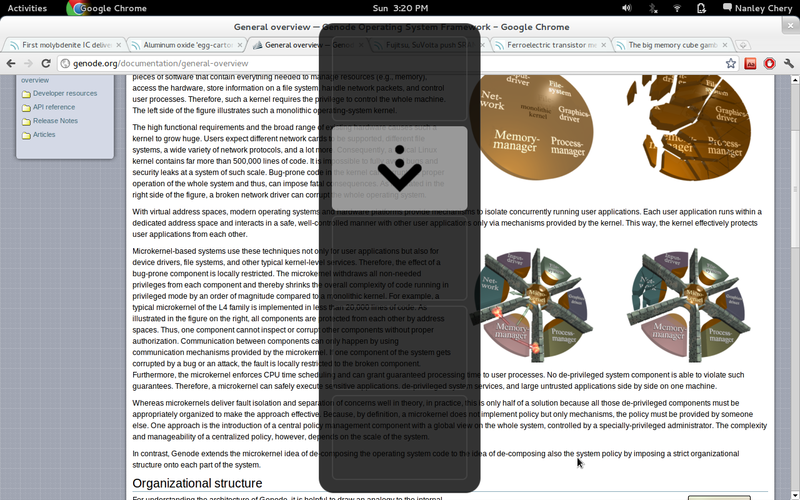 For alt+tabbing however, because the purpose is mainly for the user to switch among apps (not activities-specifically), the current interface is probably suitable. With multiple instances, and when spread across different workspaces, however, labels should make application switching easier. Update: Please make sure to check out another take on this idea – automatic labeling. While the current shell is doing a great job being simple and easy to use, there are a number of difficulties the interface creates. One of these difficulties is reminding the user what he or she is working on in a workspace, when there are multiple workspaces in one session. The following is my analysis on the current situation and a proposal for how we can improve workspace management in GNOME Shell. Note: The mockup above is meant to portray the concept and is not a requirement on how it MUST look. The implementation details can vary and is ultimately in the hands of the GNOME design team. Some variations may include: having a rounded input field, having an icon that expands to a text field upon click, or even having direct label entry into the mini-workspaces on the right. With labeled workspaces, the problem (as it currently exists) of reminding the user of their activity per workspace is solved. I believe the manner in which I have presented the concept does not complicate the UX for the simple “one workspace” user, an provides functionality for the “multiple workspace” user in a manner that improves their workflow without being disruptive (to both demographics). With labeled workspaces, other GNOME shell aspects – working with apps in different workspaces and working with workspaces themselves – improve as well. I will cover these improvements in a later post, so stay tuned!